» Meeting the Tassie Premier! Latest NewsMeeting the Tassie Premier! Some of our 20+20 participants had the opportunity to attend a state government function hosted at Wynyard Council on the 22nd November. It was a politically star studded event, with nearly every key minister there, as well as all of our local community stars! We were stoked to talk about Project O and our graduation into the 20+20 Program with Minister for Women and Human Services Jackie Petrusma. 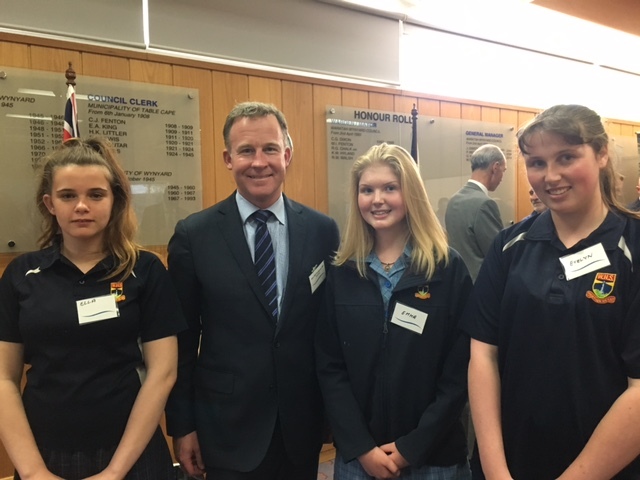 And then Premier Will Hodgman came over and we got to speak with him directly about what our program aims to achieve, and the sorts of events that we are working towards. Such a great opportunity to access the political system and talk about our experiences as young women wanting to make a change. Next step: Parliament!